I’m making slow but steady progress on the IM system for Big Mouth. 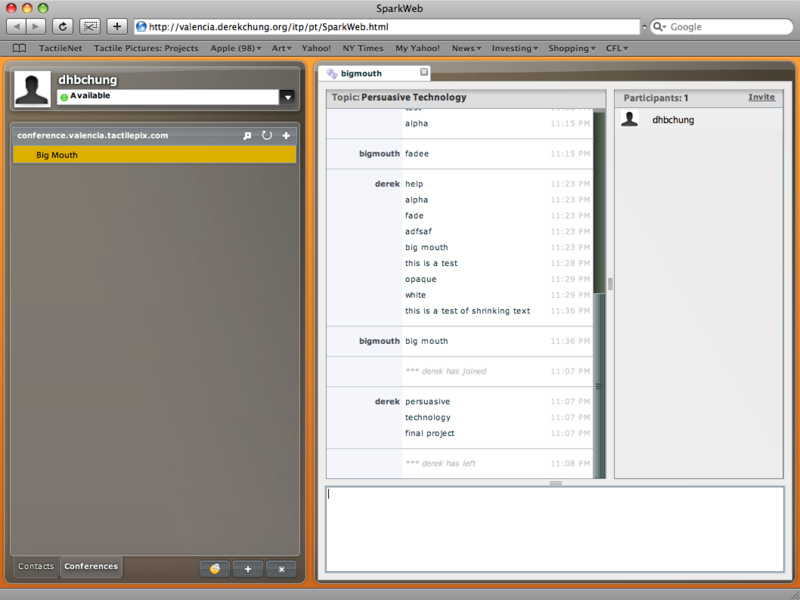 I settled on using OpenFire and SparkWeb, an open source Jabber server and client. The server probably won’t need much if any modification, and the client can use the standard Jabber/XMPP protocol for the IM. The client is written in ActionScript and Flex, so it’s relatively easy to modify. I changed the design somewhat from the original idea. Instead of having several pieces of the interface to indicate the amount of each user’s speech, I’ve simplified to a single main space. Users’ messages will appear next to their icon each time they send a message, and the message will gradually shrink, fade and move towards the center. 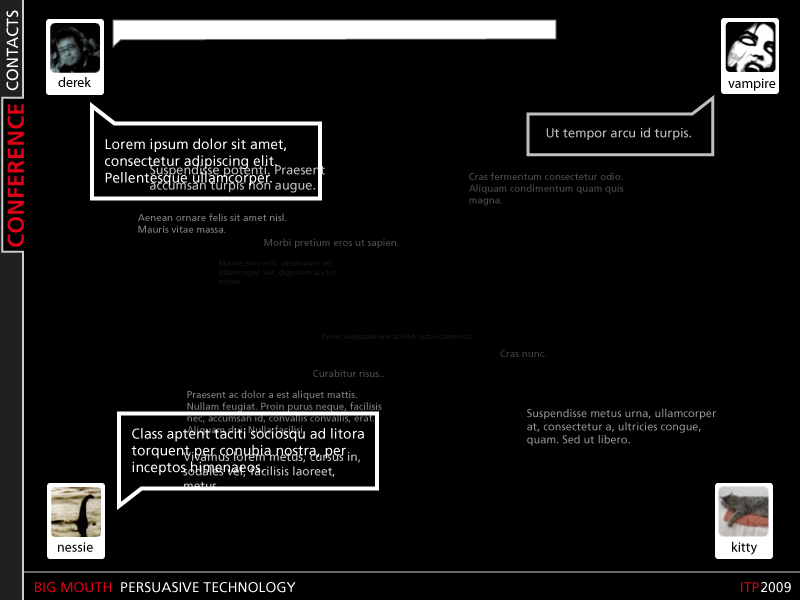 If a user speaks too often, their words will overlap and be illegible, so it encourages them to wait and allow others to speak. The conversation space is now more representative of a “public space” or the “public sphere,” and the users’ contributions to it (and whether they are exceeding their share) are readily visible. Additionally, it gives the user the illusion of more control – they can type when their space is free, and the space clears at a predictable rate. 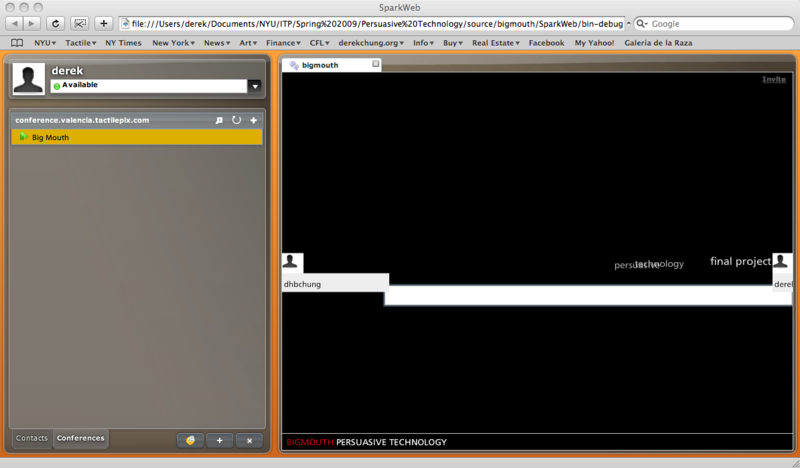 Currently, I’ve modified the SparkWeb client so that it has the core of the mechanism to perform as designed. However, the interaction, presentation and animation needs a lot of refining, and some of the rest of the interface needs to be restyled. I also need to get the server running on an external server (currently, it’s just on the server I have in my home network), so that I can demo from ITP and other sites. I hope to have the client in shape to try some user tests by next week, with a little time left over to refine the design before the final class.